American synth trio Au Revoir Simone have stepped out from the shadows a little on “Moves in Spectrums”, their fourth album in a decade. They were never a dark band, don’t let the adoration of superfans like David Lynch confuse you, but they were introverted and their sound straightforward in its small way where basic electronics meshed with sympathetic but independent, occasionally folky female leads. The trick was that little thorns would stick and cut occasionally if you weren’t careful and sadness would completely dominate and then just evaporate. It was this that made them special and why so many would always come back for more of something that they couldn’t quite put their finger on. Over the course of three albums Au Revoir Simone had gone from their relatively lo-fi, cheapo keyboard aesthetic to something far more expansive and expensive without ever compromising what is essentially their sound. Their last “The Bird of Music” was in many ways their most experimental but almost their most whimsical; it had more sonic clout than the previous two releases but it was also hard to escape the feeling that three albums from the trio may be enough. “Moves in Spectrums” goes some way in proving this hunch to be somewhat short-sighted and premature. Opening track “More Than” with its menace and prowl and dominant drum pattern and droning synth has only the bright harmonised chorus that reveals the band’s identity and it sounds great. “The Lead is Galloping” with its interestingly reversed, request hook of ‘Nobody put your hands up’ is a lolloping, sarcastic low self-esteem anthem and both “Just Like a Tree” and “Somebody Who” (featuring some all too brief but totally gorgeous cowbells) plunder satisfyingly rich-sounding, 80’s electro chart pop. Swirling and ‘ha-ha-ha-ha’ voiced “Boiling Point” is a commendable homage to Laurie Anderson and “Crazy” has the most incredible use of synths as if they were guitars that you will have heard for a while. There are some odd decisions made here though and this is something all of Au Revoir Simone’s previous albums suffer from; plonking a track in, three in this case, whose inclusion seems to make little sense to anyone other than, I presume, the band themselves. Personal songs or experimentation are one thing but “We Both Know” is a very boring, almost five minute, semi-instrumental that goes nowhere, vocals popping up in the last minute and a half to be forgotten forever. “Love You Don’t Know Me” is that one line repeated over a minor MOR electronic keyboard melody for three minutes and album closer “Let the Night Win” although superficially vibrant, is not exactly captivating. It’s almost a complete certainty that the band have better material but they’ve decided that these tracks are the ones that should be heard; it’s frustrating and feels oddly self-indulgent. 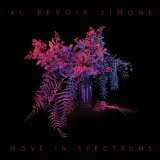 “Moves in Spectrums” is an album where the good is some of Au Revoir Simone’s best and the average is still present. Every album has been more interesting than the last and this is their most cohesive in many ways and certainly the most assertive, a much needed attribute that the band required to move forward and to avoid the sometimes all too appropriate ‘nice’ tag. They are currently one of only a few female groups making this particular type of warm, slightly eccentric electronic music and therefore the competition may not be great but they do still lead in their genre. The feeling now though is whether Au Revior Simone can find that one brilliant album that they surely have in them as sadly, despite the very strong opening, this isn’t it.